As a busy mom who can easily get stressed out, doing projects of any kind is something I have to work myself up for. I know how fun they usually are for the kids and I also know how beneficial hands-on learning is, but interrupting the normal flow of things with something different is hard for me. 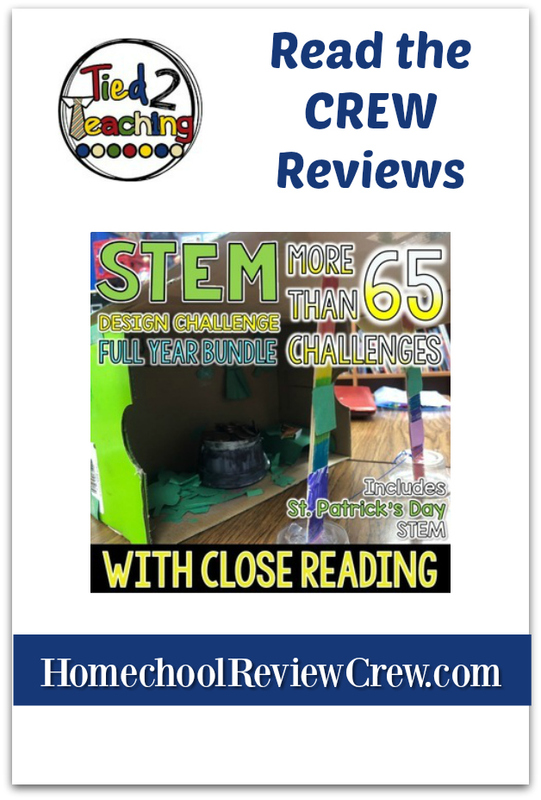 When we were given STEM Activities, Full Year of Challenges with Close Reading from Tied 2 Teaching, I was both reluctant and convicted to try them out. My kids love and need to dig their hands into things for optimum learning and to work on their problem-solving skills so I knew how valuable these activities could be despite my resistance. The STEM activities come in the form of digital downloads that include monthly/seasonal activities designed for 3rd-6th grade level students that would last you at least a year doing 4 activities a month. Within each PDF project file is a QR code and link for the close reading passage, various pages for close reading questions, project analysis, and some examples of other kids' completed projects for ideas. Most projects required normal craft or household supplies that you likely have or could easily get at the store. For every project or challenge, there is a themed passage for the student to read and then a close-reading worksheet to fill out that asks them questions about the passage that often requires a closer look at the passage. Then the student is to focus on the project through a series of worksheets that facilitate planning, problem solving and evaluating how it went once they are finished. The intended grade level is 3rd-6th grade so my 1st grader is a bit under the age range, but she was actually a great side-kick for my 'tends to give up when the answer isn't readily apparent' 3rd grader. Due to the large amount of reading and writing involved, I wouldn't recommend this for a younger student without older ones to guide or heavy parental involvement. Overall, the kids really enjoyed these projects. Like I alluded to before, my son had a tendency to give up after his first idea would fail, but luckily his sister is built to keep going no matter what some days so they were a great team. The reading and writing aspect was sometimes resisted by my son, but once he got going it was clear that the work helped him dig in better to the problem-solving at hand. They were always very proud of their final product which was fun for me to watch. Since this is a digital product, we would be able to do any of the projects again at a later date. Considering the open-ended nature of many of these, I think it would interesting and potentially really beneficial to have students do them again weeks or months later to find alternative solutions they hadn't thought of the last time. This is a great way to work on problem-solving skills. I really appreciated how the design of these projects mimic real life and real job situations. Since my husband works as an engineer, he could identify to the kids all the elements of his own work in what they were doing. It seemed to be one of the first times they seemed to conceptualize what 'real work' could look like beyond a mailman or garbage trucker driver. There are a ton of activities so we certainly haven't gotten to them all yet! Follow the link below to see what different projects some of the other families' tried!